The latest police-involved fatal shooting of a Black man prompted a crowd on Chicago’s South Side to face off with police well into Saturday night. 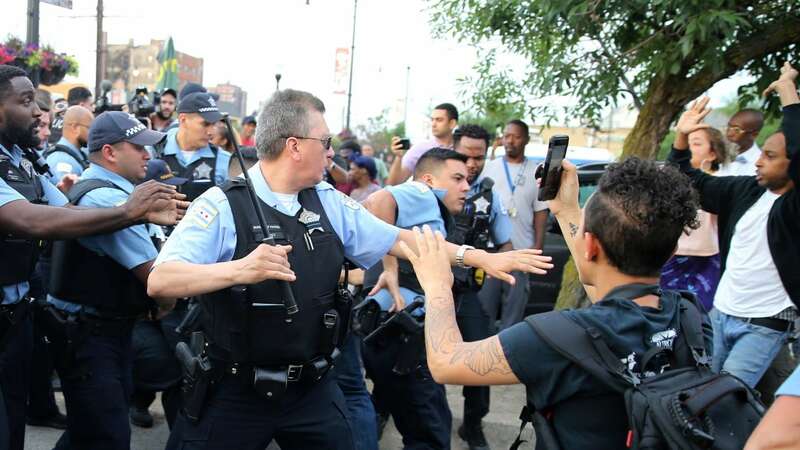 The Saturday afternoon encounter erupted when police officers noticed Harith Augustus, 37, with a bulge at his waist that they suspected could be a gun, Fred Waller, chief of patrol for the Chicago Police Department, told The New York Times. Officers approached Augustus, a Black man, and an officer fired the fatal shots, Waller said. Police found a semiautomatic weapon on Augustus’ person, the Times reported. Authorities did not believe he was licensed to carry a concealed firearm. Some people at the scene alleged that a woman police officer shot Augustus at least five times in the back while he ran away, the Chicago SunTimes reported. The officer was taken from the scene in a police vehicle as the crowd began to form, according to the Sun-Times. Chicago Police Department spokesman Anthony Guglielmi discounted those reports, saying that the officer who shot Augustus was a man. Augustus was taken to Jackson Park Hospital, where he was pronounced dead shortly before 6 p.m., Frank Shuftan, spokesman for Cook County Board President Toni Preckwinkle, told the Chicago Sun-Times. An autopsy was scheduled for Sunday, according to the Sun-Times. The killing prompted an angry crowd of about 100 to linger at the scene for hours, chanting “murderers” and no justice, no peace.” Some hurtled rocks and bottles at police, resulting in several officers being hurt, according to the Chicago news organization. The tension escalated later in the evening as police advanced and tried to push protesters back from the scene, hitting at least six people with batons, prompting some protesters to punch back at police. Four people were arrested, according to Guglielmi, three for felony charges.